I have a question with some assumed check mark box answers... but I would like to offer up an "other" text box...so they can type in their own question or comment. Is that possible with the check mark question? 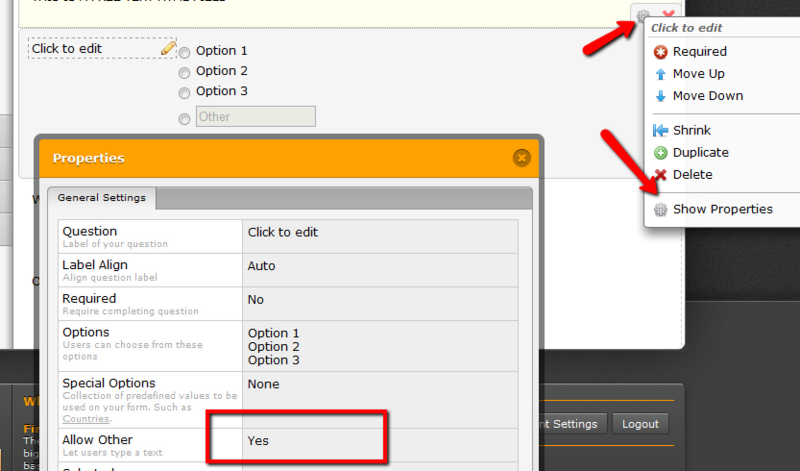 You can enable 'other' on Radio buttons but not on Check boxes. Unfortuntely this option is not available on Check box fields, as a workaround may I suggest you add a question with a text box/area, underneath the check box options and ask for the users input there. How do you get the other field to show up in its own column. It always wants to show below the other options even with column widths lowered and the cumn spread set to 4. Could you please open a new thread for your issue, please? Because of the nature of how the form has been embedded on your website (i.e using full source code) , a resolution will not that be that straightforward, so its better for a new thread be made where we can deal with the issue seperately.